"Earth, Wind & Fire" is ClearWater Artist Studios's next big exhibit. A collection of artists have collaborated to create one unique and elemental art gallery. These artists are of all different mediums and have enjoyed their collaboration together. According to Sarah Gay the manager of the studio, who has in the past organized the "Guest Artist" series as a concept for ClearWater last year, "I threw it open to ClearWater artists, the artists who lease studios here, as well as outside artists that I curated. After several successful such exhibits, it was Regina (one of our tenants here) who stepped up asking for a show in January 2017, and then she invited the others to join her for a joint show. They came up with the name and layout of the show as a group." According to the ClearWater Facebook page, "[This show is] A joint show juxtaposing the different styles of four artists: Regina Calton Burchett Fine Art, ClearWater Resident artist (pastels + oil); Debbie Rasberry (pastels); Carmella Jarvi (glass); and Chris Craft (encaustic abstracts)." A little fun fact about the show, artists Chris Craft and Carmella Jarvi are spouses, and have happily been married for over two decades! The Opening Reception of 'Earth Wind & Fire' is January 13th, 2017 at 7:00pm and will be held at The Gallery in ClearWater Artist Studios. The exhibition will remain on display during normal hours through February 7th. There will also be Art Demos for 'Earth, Wind & Fire' on varying dates, so be sure to check out our calendar. We were lucky enough to get in touch with the talented artists of this show and not only learn more about their pieces, but also their story as artists. Tell us a little bit about you. Have you always wanted to be an artist? Chris Craft: I have always wanted to be an artist. I have taken several roundabout routes however. First, I was going to be an architect, (because art was not considered a viable career in my house). I only completed 3 of the 5 years in architecture school at Texas A&M because of the math required. Next, I went to the Art Institute of Houston and found I loved design. I did really well graduating second in my class. After 10 years in the graphic design world I got tired of creating under the requirements of others so I went back to school at UNCC and earned my BFA degree. I have been a studio artist since and couldn't be happier. Regina Burchett: I have always done art and started drawing when I was very young. My father was an Air Force pilot so we moved a lot, and my mother took me to an art class with her when we lived on Guam. I loved painting that day to classical music, and find that it is still a very uplifting experience for me – working on a painting I am excited about while I listen to music I love. I studied art in college and worked with many different mediums. In 1999, I discovered pastels and have focused on working with them primarily since that time. This last year, I have stepped away to work in reductive charcoal and oils, and am having a great time! Carmella Jarvi: Always wanted to be an artist and teacher. (Was art teacher at Northwest Cabarrus HS for ten years. Left in 2006 to pursue my own dreams.) Was sketching cartoons as little kid & fortunate to have private art lessons in elementary school where I learned to paint with watercolor & oils, learned contour line & how to sketch from life. Debbie Rasberry: I was blessed to have a good art teacher back when I was in high school. I decided to major in Fine Art at college, in the early 80's, but hated the program and dropped it. I shrugged off being an artist. Over twenty years later, I had moved to the USA from South Africa, married and had two small children, and we were exploring the beautiful Blue Ridge mountains near Boone, when this thought bubbled into my head that I would love to paint this beauty around me. Two years later, in 2006, I signed up to take a pastel class at Queens College Continuing Education program, taught by my now dear friend, Carmella Jarvi, and began my art journey. Tell us a little bit about the inspiration for the pieces being presented for "Earth, Wind & Fire." Chris Craft: Most of the pieces in this show are abstracted landscapes in keeping with the "elemental" title. 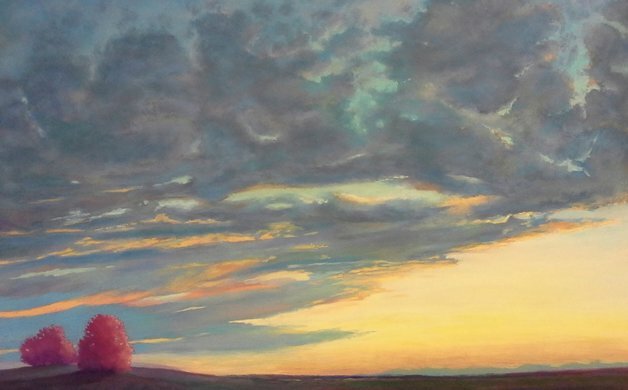 Regina Burchett: The main subject that I love to paint is clouds moving with the wind, Deb does wonderful work with her pastel landscapes, Chris’ evocative encaustic pieces include landscape and water, and Carmella works with Fire in making her lovely glasswork. My friend Deb Rasberry originally suggested the name, and with the combination of the types of art we each love to do, we thought it was very representative of the combination of work we each bring to the exhibit. Carmella Jarvi: Most of my life, I've been trying to capture "water." Until 2011, this was through painting, mostly watercolor and then pastel painting. In 2011, I went to Playa del Carmen, Mexico for a family wedding. After swimming in the beautiful tropical waters, I knew my paints would not capture the depth, luminosity and intensity of this water. 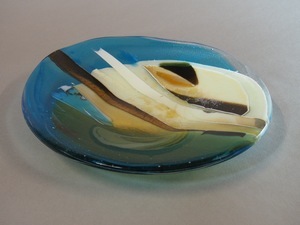 I decided to switch to glass, which was not easy an artist, as well as being married to an artist. I also had been self-employed since 2006. However, I'd always secretly loved glass. I also had a talented grandmother who supported, encouraged, celebrated me being an artist, who had some sweet pieces of original glass too! A friend who worked with glass invited me to come out and traded me labor for experience. In 2013, I received another Arts & Science Council RAPG (Regional Artist Project Grant) for 20 sessions with this glass artist. About the same time, I began seriously up-fitting my painting studio for kiln glass. So, although I'm inspired by water and nature, I use heat (or fire) in all my glass! 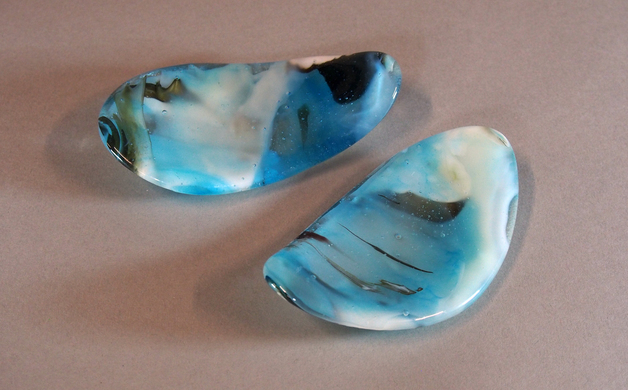 (FYI, basically three types of art glass: cold (like stained glass, mosaics), warm (or kiln formed, using often electric kilns), and hot glass (glass blowing with furnaces and team of people - usually). Debbie Rasberry: My main inspiration comes from nature, the great outdoors, the Earth. I have visited many states in this great country, and seen so many beautiful places, but I am most familiar with North Carolina. From the dune-lined beaches of the coast to the distinct blue of the majestic mountains, I find all the inspiration I need. The title for the show comes from the combination of all these elements, but it also plays on the name of a 70's band that we grew up listening to! All four of us artists come from different perspectives and different media. I paint landscapes, primarily (earth), Regina paints beautiful skies (wind), and both Carmella and Chris use heat to create their work (fire). All of our work is inspired by the elements of nature, but we use different mediums and methods to achieve what we're expressing. I think our combined work really compliments each other. How has it been preparing for the opening? Has the community been welcoming? Chris Craft: The preparing part is the same with every opening, just grind, grind, grind. I have had no contact with the community as of yet. Regina Burchett: We have been working on this for several months, planning details of the event and getting our work ready. We wanted to bring new and varied work to Cabarrus County and surrounding areas, to spark more interest for art and artists. 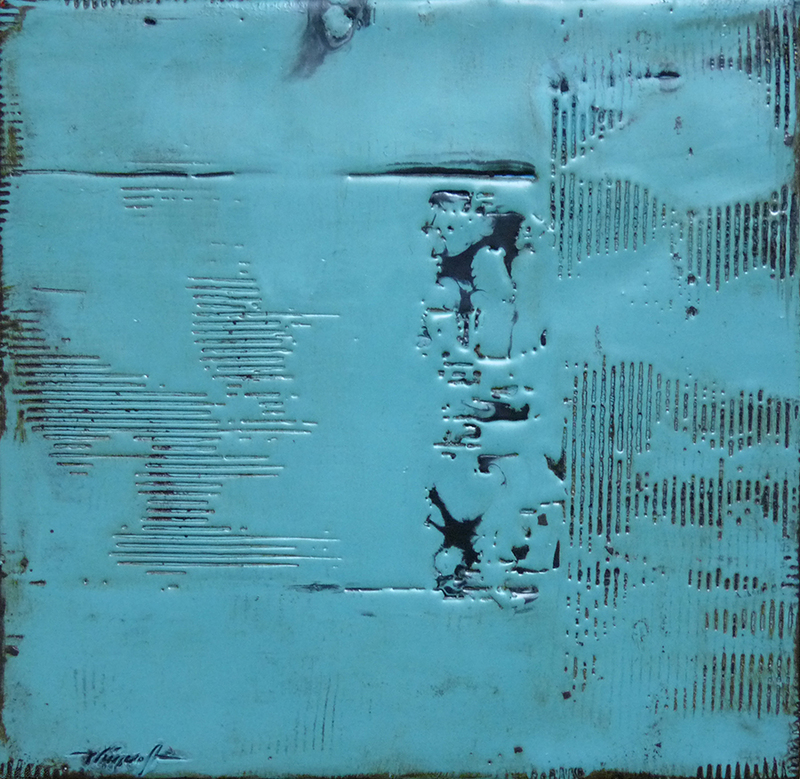 Pastels are not that well-known of a medium, and when we add glasswork and encaustic, these are definitely new and interesting works that many of those in our area may not have seen before. We also hope to let more people experience Clearwater Artist Studios and Gallery, which is an exceptional project by the City of Concord. We currently have 15 resident artists – the Southern Piedmont Woodturners are at Clearwater, and we have artists who work in oils, pastels, acrylics, charcoal, stained glass, fabric art, leather work, and pottery. Most of the Clearwater artists give art classes and we have continuing rotating exhibits in the gallery open to the public, and many events throughout the year. Carmella Jarvi: I've been preparing since earlier in 2016. Community has been welcoming since I was an art teacher in Cabarrus County. Of course, I have seen lots of changes in this 20 years. These days, I'm in studio more than out and don't have reason to be in Concord as much. BUT, was excited to join Clearwater Artist Studios as guest artist for this show. Sarah Gay and her community has done a great job of building a place for creativity in Concord!! 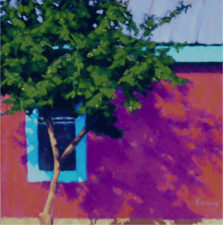 Debbie Rasberry: Regina [Burchett] is a good friend of mine, and a fellow pastel artist, and she invited me to do a show together at Clearwater Art Studios, where she has a studio. I was thrilled! I have visited Clearwater many times, and I love the industrial building and the location. The Concord community is especially supportive of the arts, and of Clearwater. Manager Sarah Gay has been invaluable in providing support and structure, as well as giving us a lot of free creative reign in how we wanted our show to look. What's been one of your most memorable moments so far while being an artist? Chris Craft: The most memorable moment will always be that first show in Oriental, NC in 1994 at Circle 10 Gallery. The whole thing was overwhelming to me but so fulfilling. Meeting and talking with the gallery patrons and getting insights that still serve me to this day. Regina Burchett: Winning awards or selling artwork are always very rewarding (especially so we can buy more art supplies). But when someone tells me that my work is uplifting for them or gives them a sense of peace – that is when I really feel like I have accomplished what I am meant to. I think we are given this interest in art, this gift, for a reason and I hope to express that and to share it however I can. I also love to educate people about pastels and their flexibility as a medium. They are the same pigment as oil paints and are very fun to work with and very forgiving! 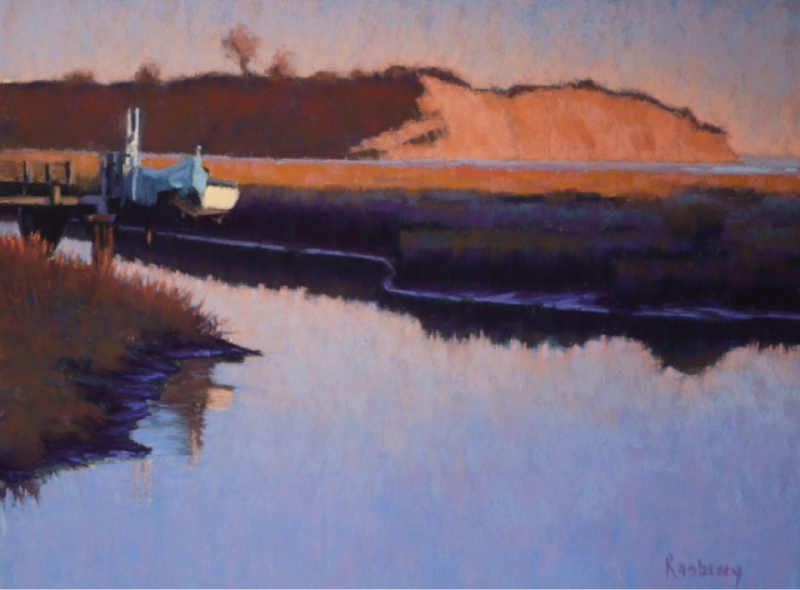 I will be giving a demonstration on Saturday, January 14, in working with pastels. This medium is a natural transition from drawing, and can be less intimidating for those artists wanting to start painting. Carmella Jarvi: Great question! There are different ones that mean different things. For example, when I crowdfunded my dream kiln and I had former high school art students invest! I'm an artist who loves business, so it means a lot when I see seeds planted in others growing. But, as far as just me, first would probably be getting my glass on an ArtPop billboard in 2014. That was a 14'x48' vinyl of MY GLASS WITH MY NAME throughout the year of 2014! The other most memorable moment would be in August of 2016, learning glassblowing at Penland School of Crafts. "Just, wow" is all I can say. I'd watched and drooled many times over liquid glass, but there I was, doing it myself. Debbie Rasberry: I entered my first Juried art competition, the North Carolina Statewide Pastel Exhibition, in 2014 and two of my paintings were accepted. 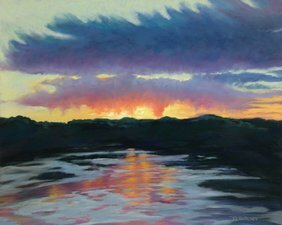 I was relatively new to pastel, and I won an award and both paintings sold! Is there anything else that we should know about you or your work? Regina Burchett: Up until five years ago, I lived in Texas. I now live in Kannapolis, and have a studio at Clearwater - and welcome everyone to come visit our show! We are lucky to have these exceptional Charlotte artists in this special exhibit, and hope everyone will come to see the variety of beautiful work they bring for the Earth, Wind & Fire exhibit! Friday evening, January 13th, from 6:00 to 8:30 pm, and Saturday from 10:00 am to 4:00 pm. Free, of course. Carmella Jarvi: Fun side note, Chris and I share a large studio on our property. 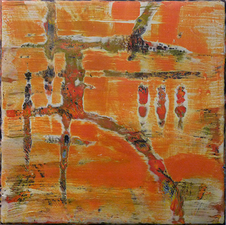 Front half is for my glass, back half for his encaustic painting. We had studio rewired in 2014 to accommodate my three kilns & cold working equipment like belt sander and tile cutter, as well as Chris having multiple hot plates, etc. for his painting. Debbie Rasberry: I'm an immigrant to the USA from South Africa. I moved to the US with my family in 1986, and to Charlotte. My parents taught me an appreciation for my surroundings and nature in our travels to the game reserves of South Africa. Seeing wildlife in their natural surroundings is powerful. I enjoy painting animals and birds too. To appreciate these talented, and dare I say humorous, artists in person, you can see their exhibition "Earth, Wind & Fire" at ClearWater Artist Studios through early February.